Kitty cats I truly cannot blame you for being upset. Here, we were all convinced that winter was on the verge of being gone for good – at least for this year! – when Staten Island Chuck silently said as much; only to be informed days later by Punxsutawney Phil that six more weeks of blustery weather was upon us! Being in Southern California, of course, I have absolutely no qualms about the extended stay of winter – in fact, I welcome it with open arms; but I imagine those of you being forced to trudge through inches and inches of snow on a daily basis are wishing that spring would simply rear its flowery face and remove you from your frostbitten misery. Darlings, just because there is ice upon the ground is no reason that you must feel suffocated by bulky outerwear; merely create a premature spring all your own via pretty accoutrements, such as Charlotte Tarantola’s Field Game Cardigan. Now, I will be honest, typically I steer clear of horizontal stripes myself, feeling that they are unflattering or masculine, yet even I have fallen head over heels for the bouncy vibe that the nautical red and white stripes proffer to the wearer; an adoration only made stronger by the ivory lace placket and brass button embellishments – two characteristics which make the aesthetic less rugby and more romantic. But I digress; such a figment of imagination is not destined to become a reality, for the Field Game Cardigan, while charming in every manner of the word, harbors the nightmarish price tag of $118.00. Nevertheless, such a style is par for the course in bringing a splash of spring to your dreary winter wardrobe; therefore it is time to embrace the next best thing to Charlotte Tarantola’s Field Game Cardigan – and that is Parfait’s Stripe Lace Cardigan. 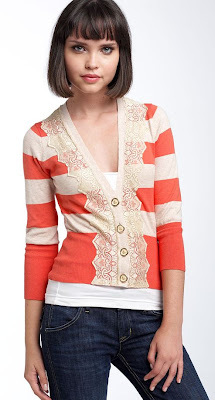 While sporting three-quarter sleeves as opposed to full-length ones, and adorned in coral and oat hues, instead of the red and white seen upon the Field Game Cardigan; at $57.90, the Stripe Lace Cardigan is every bit as capable of welcoming the sweet-smelling spring season into your closet, at a price much more friendly to the frugal fashionista! Thanks to Anthropologie and Nordstrom for the pictures. I love this cardigan! The lace details makes it more special! You must be reading my thoughts...today I was thinking that everybody is wearing stripes these days, it is so boring, how could I wear them in a slightly different way...? Love these cardigans! I know what you mean though, in SoCal, winter is great, but I do feel for all my peeps on the east coast who are dealing with all the snow! Thank you for your sweet comment btw, it made my day! such cute cardigans!!! i think i'd actually go with the cheaper version on this one. Hmm, I think I prefer the bargain one actually. I'm a lover of 3/4 sleeves, what can I say! And btw, you ALWAYS find such close matches! Okay I don't usually do the stripe thing either but this is adorable!! My office is so cold somedays, this would be perfect!!! btw I love your new layout!! Hi there, great new blog design! I too prefer the less expensive version, because of the shorter sleeves, lighter red (almost orange/coral), and deeper V, which makes a cardi more modern and not so grandma. What gorgeous cardigans! I love the lace detailing. I hope you had a wonderful Valentine's weekend! P.S. Meant to tell you I am loving the new blog look! I actually prefer the 3/4 sleeves, so I'll have to go with the steal ;o) Besides the slight difference in color, they're practically identical! Great finds! Hey Erika! Happy Chinese New Year and Happy Valentine's day! :P love the cardi. Love the colour and the lace. Makes it a perfect outfit for V-day. All lovey dovey :P XOXO! Love you! I'm definitely going with the cheaper option on this one! I love the color and cut. Great finds! These are so gorgeous! Amazing finds! I love stripes and the lace detail makes it really cute! I also like your new layout. Both are great pieces... but of course I'd love to save a few dollars.. so I'd go fo the latter. Hope you're having a fabulous day Erika! It's a cool and sunny day in Hawaii! both of them are so cute...what a great alternative! they are both equally cute...the second one is a great alternative! I actually like the look of Parfait's better, esp with it being layered with a longer top. It gives it a more youthful image. My vote's with Parfait. That cardigan is so cute! Love the lace and the stripes, I can't stop looking at it. I steer clear of horizontal stripes too but I love the combination of lace and rugby. Maybe it could even be a DYI project? cool cardigan with pretty details!..congrats on the new site design, looks super cute..
Whooo- Love that cardigan for less! Hey, Congrats on being featured on IFB! These are both so adorable! I do prefer the Parfait one. The three quarter larms make it look so much cuter. Erika, I soo agree - nautical stripes equal summer (and on the upper half of the body horizontal normally isn't too bad, is it?). And this time I would definitely go for cheaper and coral. Great find! being from staten island myself, i'm still standing firmly by chuck's prediction, but we'll see..
it's crazy how similar these sweaters are! im loving your new layout! Lovely cardigan and great price! How do you FIND these?!? I love the combo with stripes and lace...so beautiful, I am definitely in love! I will choose the bargain this time... I love the length of the second cardigan and the color is more muted. erika, you are totally reading my mind! i saw that cardigan on gigi's blog and fell in love with it! i think i need to order the nordstrom version! 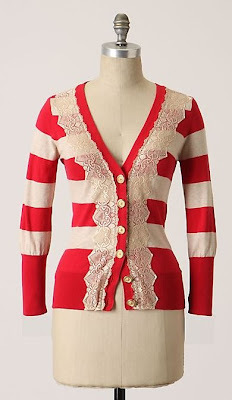 I just love cardigans and the lace and stripes on this one make it so unique and lovely. Plus the colors are so pretty. Great post!! I actually had to check those cardigans multiple times to spot any differences! WOW! JEALOUS of your SoCal weather... I'm wearing all the cardigans I can right now! Love this one -- I agree about horizontal stripes, but have found that on open cardigans, especially with thinner stripes, they can be quite lovely. I ADORE this lace. Okay, seriously, Erika?? Be my personal shopper! PLEASE! You are nothing short of amazing at finding awesome stuff and for cheap, too! Stripes are always so hard to igure out, but here they look lovely - and I do like them both, perhaps the second one more so. And wow, I took a little blogging break this weekend and came back to a new you ;) ~ the makeover is lovely! What an amazing cardigan. I love the lacy details. I love the cardigan, and your new blog design! I'd much rather be a spendthrift but alas I'm in tightwad mode. at first i'd thought you'd posted two pics of the same cardigan. but when i looked closer i could see the difference in the buttons. its really hard to tell. plus i love saving money and looking cute. whaaat?!!! you are getting better and better each week! that is a good match. i love the red and white stripes with the lace. Love the new look! It makes your blog look more unique. Hmm I'd have to go with tightwad this week b/c I actually prefer the coral color and the 3/4 sleeves! I think the overall effect of the cheaper version is much more feminine. First of all, I am obsessed with stripes. Second, my favorite color combo is red and cream. And the third, the lace just makes it 100000x prettier. Too bad I'm cheap and $58 for a cardigan is too much for me, haha. ahh I totally saw this in stores today!! Great find! I love the Spring colors but like you horizontal stripes sometimes scare me! Oh, I am envious, I want it! oh i love both of them but they're still sadly too expensive for me! haha. the woes of being a poor student. i would LOVE to have the one in red! Love your pick even better dear! That cardi is going striagh on my wishlist! THEY LOOK ALMOST EXACTLY ALIKE!! ill take the knock off THANK YOU! Love the cardigan. Striped tops are my wardrobe staples and signature garment. Love that they are finally back on the fashion agenda. I am loving both of these cardigans! They are such great finds, Erika! I adore the stripes and the lace paired together. I'm going to be a tightwad this time and go for the cheaper version. Plus, I love those gold buttons! I just have to tell you how much I love your site and all the effort that goes into each and every post! You've made it really special. you officially rock at this darling. I can't decide which one I love better...but you are awesome for offering me two options! Wow! For once I prefer the cheaper version! I like the buttons more. LOVE LOVE LOVE this cardi! I actually prefer the cheaper version of the two! Those cardigans are to die for! So lovely!